New Premium Mats - Upgrade for just $5 more. My daughter absolutely loves these and now my 2 year old son likes to get in on the fun! My son loves cup stacking. He enjoys every Wednesday he is in class. Keeps my kids busy while improving their hand eye coordination. We have had our Competitor package for a couple years now. We love using them! My eight y/o loves to whoop me every time we play! And when we play we also try to come up with new stacks. This purchase is for a friend! If you don\'t have a set this is the one to get. The whole family gets in on the fun. Makes for an enjoyable family game night! When i got the cups it was like everything i wanted them to be thanks speed stacks and i have ordered from you guys like 15 times now but thanks for making this amazing sport. My daughter loved this in gym class! Looking forward to surprising her with her own set. I do speed stacking in school and I practice a lot in gym and I do competitions in school. Know I am one of the top fastest speed stackers in my school. ive got back into stacking and it feels great! i have this set since 5 months and the quality is AMAZING.They nevar stick together,i recomend these cups to everyone and its great for beginers! (-hope i could get the pro series cups and the new mats too:(-). I loved this set. I got it with the tie die, and really got used to it. This competitor set is great for beginning it has all you will need some cups, a mat,and a timer, and a bag. This is a perfect Christmas set for all of the beginners or maybe even an Easter present. Also try the minis those will give you a big challenge. OVERALL RATING 100/100. 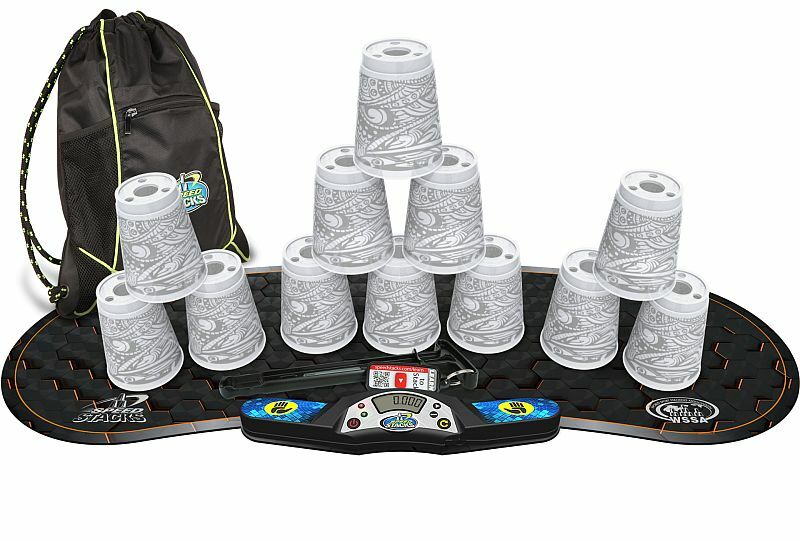 I absolutely am pretty glad that I ordered this set for my birthday becuase its comes with everything I want and I am pretty much a beginner in sport stacking and I wanna learn more so I feel as if this opportunity will help me improve. I also got this set because I am going to start off with something easy and simple before getting the new improved sets. I just received my new speed stacks....they are AMAZING!!! I ordered them Friday and got them yesterday....very quick shipping. I have been stacking since i was 7 years old and never plan on stopping....i would definitely recommend these to keep your kids occupied in stead of watch tv...THANKS FOR MAKING THIS ENTERTAINING!! I loved this set. I got it with the tie die, and really got used to it. I gave it four stars, because my younger cousin got a hold of one ant threw it at the wall. It then broke. :( I am thinking of getting glow in the dark blue with one replacement cup for my tie die set. But overall, I loved this set. I got this set a month ago as my starters set. My cups aren't out of round or broken at all! When I bought this set, it was $40 and it came with minis and mini mat too! I only got the Gen3 timer but my next set (Ultimate) is on the way already! I bought these from my school in black flames and they were truly magnificent. I might buy more of these so i can build bigger and better creations. also my favorite sport. i got these like a week ago and my record for the cycle stack is 11.09 seconds. Glow in the dark blue cups are AMAZING!!!!!!!!¡¡¡!! The competitor set is good the mat is just a little to small, but then again it's the official timing device of the wssa, overall everything else including the pro timer is good. THIS HAS TO BE THE BEST STARTER KITS OF ALL TIME. I MY SELF CAN LEARN CUP STACKING IN 2 DAYS WITH THIS SO BUY IT!!!!!!!!!!!!!!!!!!!!!!!!!!!!!!!!!!!!!!!!!!!!!!!!!!!!!!!!!!!!!!!!!!!!!!!!!!!!!!!!! The cups are amazing,they have flames on them.They stack very WELL! The Black Flame cups are so awesome.I`ve been cup stacking in P.E.They`re so AWESOME!!!!!!!!!!!!!!!!!! this set is awesome because, you have a stack mat, a set of cups, a timer, a DVD, and the little baggig thinggie that can carry everything. i love the speed stacks i started stacking with my school i am hooked on them now i keep asking to get more cups. I have been stacking for 11 days now and my record is 11.89 I can not put them down. My son loves his set but finds that other cups he has handled have a bit more friction -- I don't know if there are differences between models. Plus, the timer was defective from the beginning but customer services get an A+ for promptly sending an upgraded version. I was excited when I got my speed stacks. I never knew I would get 4.54 on the 3-6-3 I was only 8 years old!!!!!!!!!!!!!!!!! I got them for Christmas and now I can't stop using them they are so much fun! My daughter is so excited to start learning to stack. She was so happy to get purple tie-dyed cups too. Good, but disappointed that they don't sell at stores anymore. when i got it everyone in my family wanted to play with it.It is so fun. I hope u get it because u just wont stop playing it. I have been waiting for around a year now and finally my dad bought me some :). I am 13 and I love stacking them now. I didn't know i was going to get 13 seconds within the next 3 days :) my fastest is 13.33. It is so fun and the dvd really helps you learn its easy to learn also!